The Gold Rush Is Here!! Spedeworth / Incarace domestic Bangers have gone from strength to strength in recent years. The Gold Rush Series will visit all eight of the Spedeworth / Incarace tracks during the season. 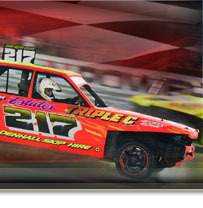 Each event will offer a Wild Card place directly into the 2017 Banger World Final at Foxhall Heath Stadium, Ipswich on Saturday 18th November for the winner of each Gold Rush Final. At each of the Gold Rush meetings the last event on the day will be a ‘Winner Takes All’ dash for cash (with a unique starting procedure) while other prizes are on offer for those who prefer entertaining. Fans will also be able to see some of the stars of the domestic Banger scene ‘close-up’ as each round will have a Meet, Greet & Selfie Signing Session. If any driver wins more than one Gold Rush Final the Wild Card place will be carried over to the next Gold Rush Series Event. Gold Rush events are open to all Spedeworth / Incarace registered drivers and temporary licenced drivers for those who wish to make a short cut to the gold! 2017 could be YOUR year to strike it lucky! The countdown to the start of the 2017 Gold Rush Series has started and Round 1 kicks off at Wimbledon Stadium on Sunday 5th February. There is of course World Qualifying points on offer and like the BWS, a golden ticket into the World Final race itself going to the winner of the meeting final with a Wildcard spot. 2 heats with £50 to the winners and £50 to the entertainers. The third race will be the Wildcard Final with the grid row drawn publicly through a throw of the giant dice! The winner of this race is presented with a World Final Golden Ticket. A fourth race on the day is a Dash for Cash race. This will feature a 3 a-breast clutch start 8 lap race with prize money of £200 to the winner and £100 split for entertainers. For the Wildcard and Dash for Cash races we will be allowing turning around in the crash zones and attacking outside in only; no head ons. Bookings are been taken now and can be made by calling 01252 322920, on the text service 07949 138108, by email info@spedeworth.co.uk or complete the drivers booking-in form on the Drivers Page of the Spedeworth/Incarace websites. We are pleased to announce the 3 drivers who will be available for the Meet, Greet & Selfie Signing Sessions. These are Julian Beaumont, Martin Kent & Michael Kent and this will take place inside the stadium under the Home Straight Grandstand and will start at 4.30pm. 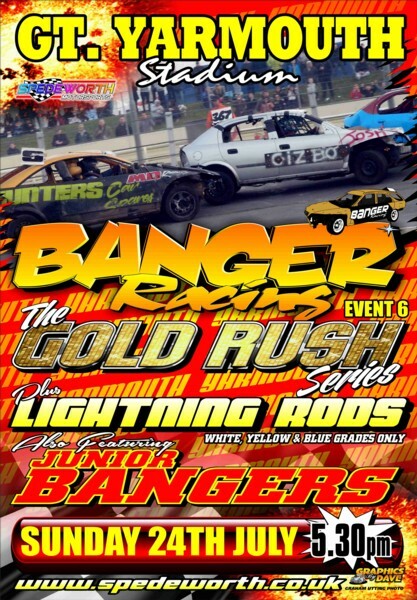 On Sunday 24th July the Bangers return to the Great Yarmouth Raceway for Round 6 of the Gold Rush Series. There is of course World Qualifying points on offer and like the BWS, a golden ticket into the World Final race itself going to the winner of the meeting final with a Wildcard spot. Attendance points are also available for visiting Southern and East Anglian based registered drivers. Heats with £50 to the winners and £50 to the entertainers. The Wildcard Final with the grid row drawn publicly through a throw of the giant dice! The winner of this race is presented with a World Final Golden Ticket. A last race on the day is a Dash for Cash race. This will feature a 3 abreast clutch start 8 lap race with prize money of £200 to the winner and £100 split for entertainers. For the Wildcard and Dash for Cash races we will be allowing turning around in the crash zones and attacking outside in only; no head-ons. 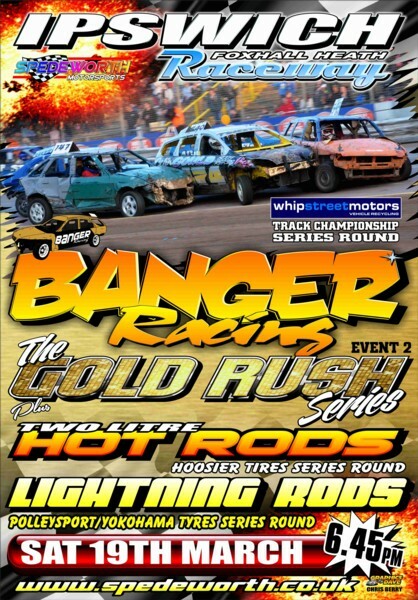 On Bank Holiday Monday 2nd May the Bangers return to the Hednesford Hills Raceway for Round 3 of the new Gold Rush Series. There is of course World Qualifying points on offer and like the BWS, a golden ticket into the World Final race itself going to the winner of the meeting final with a Wildcard spot. Attendance points are also available for visiting Southern and East Anglian based registered drivers. We are pleased to announce the 3 drivers who will be available for the Meet, Greet & Selfie Signing Sessions. 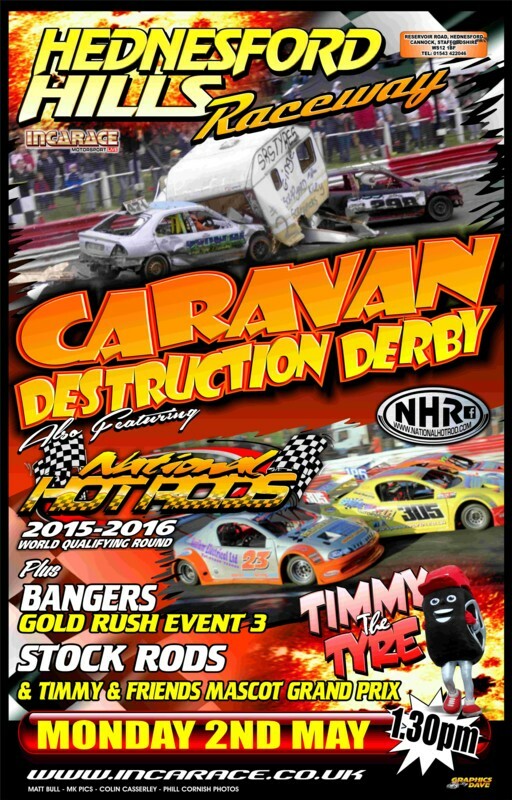 We have Round 1 Wildcard Winner & 2015 Gt Yarmouth Track Champion Simon ' Mungo' Berry, 2015 Banger Points Champion Craig Thurlow and 2015 Ipswich Banger Track Champion Craig 'Nippy' Hook and this will take place inside the stadium after you walk through the turnstiles and will start at 5.30pm. 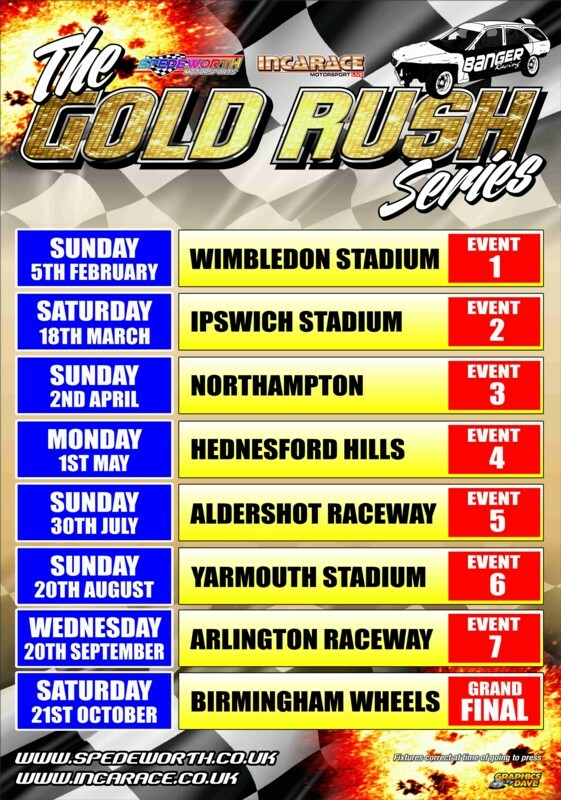 With Round 1 of the new Gold Rush Series just gone we look forward to Round 2 which takes place at the Foxhall Stadium Raceway on Saturday 19th March. There is of course World Qualifying points on offer and like the BWS, a golden ticket into the World Final race itself going to the winner of the meeting final with a Wildcard spot. This meeting is also Round 1 of the 2016 Ipswich Track Championship sponsored by Whip Street Motors.